You can download Coke Studio Season 10 - Mix High Quality Mp3 Songs. 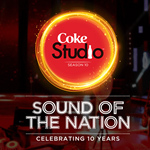 Coke Studio Season 10 was released by Various Artist in year 2017. There are about 28 mp3 songs in album Coke Studio Season 10. Coke Studioâ€™s Season 10 hits the television screens this August 2017, with a whole new way of Pakistan National Anthem by the leading singers of Pakistan music industry. Several singers including Rahat Fatah Ali Khan, Ali Zafar, Shafaqat Amanat Ali, Sajjad Ali and many others are going to appear in the Coke Studio Season 10. Like previous seasons, this season is going to introduce a whole new way of some old songs with the combination of Pakistanâ€™s top singers working under the supervision of Strings band. Coke Studioâ€™s 10th seasons originally started from 11th of August 2017.